We’ve seen a sharp increase in those in the last few days. 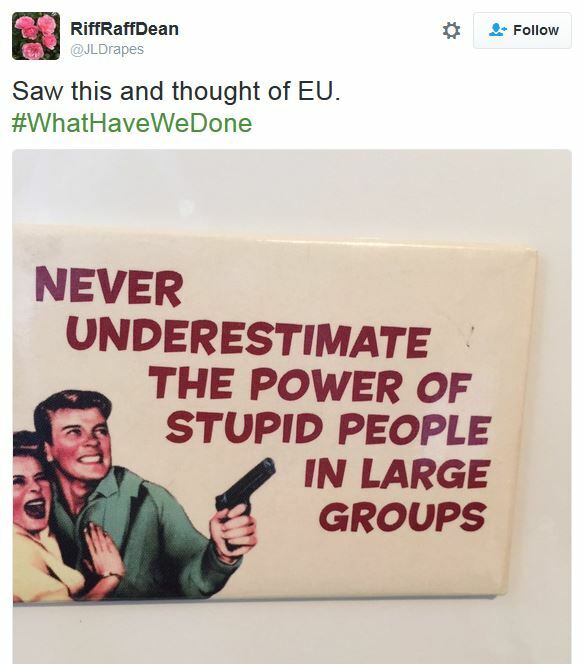 Somehow people who were already of evil will – and I’m not blaming the leave campaign, I want to be quite clear about that – but people who were of evil will are using this as an excuse, a mere sham, for their hatred to be expressed. People of ‘evil will’ is (literally) a damning designation. This evil is not ‘natural’, in the sense of earthquakes, storms, famine or disease, all of which cause untold human suffering: it is the evil which man himself causes, for it is willed by him. It is negative, destructive and devastating. It is man’s desire to oppose all that is good, noble, true and righteous. To choose and determine evil is to act contrary to the will of God, who is holy, righteous and perfect love. To be of evil will is incompatible with being Christian. All Christians are called to be disciples and to serve God, but in the Church of England some are set apart formally for particular service in the kingdom of God. And one expects these clergy – those who preeminently pastor the flock, proclaim the word of the Lord and patiently watch for signs of new creation – to manifest the light of Christ in a darkened world. ‘Let your speech be alway with grace, seasoned with salt..‘ (Col 4:6). So when senior clergy jump on Guardian/BBC bandwagons and rebuke their fellow Christians for the sin of supporting UK-EU secession, one looks for a just and gentle mingling of grace with salt. One looks in vain: Brexit Christians are the new lepers, and some Remainophile clergy have no interest at all in touching them. In a heated Facebook exchange, the Dean of Manchester, the Very Rev’d Rogers Govender, accused the Rev’d Dr Giles Fraser of being racist for no reason other than that Dr Fraser finds congenial fellowship with Brexit Christians. Just let that sink in for a moment. Giles Fraser leads one of the most vibrantly mutli-ethnic churches in the Church of England. His wedding a few months ago (to an Israeli Jewess) was a multi-racial carnival of colour and Caribbean cuisine. The groom himself wore.. well, it wasn’t top hat and tails. He is a Guardian columnist, an enemy of capitalism, resister of nationalism, opponent of Establishment and the scourge of right-wing everything. 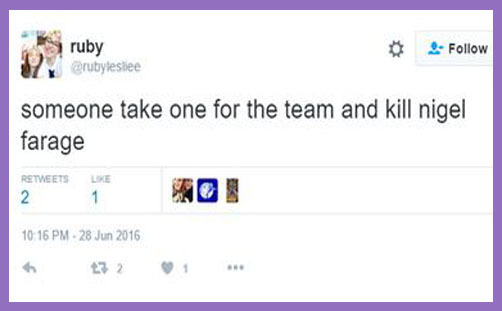 But because he supports Brexit, he is judged to be ‘racist’ by the Dean of Manchester. 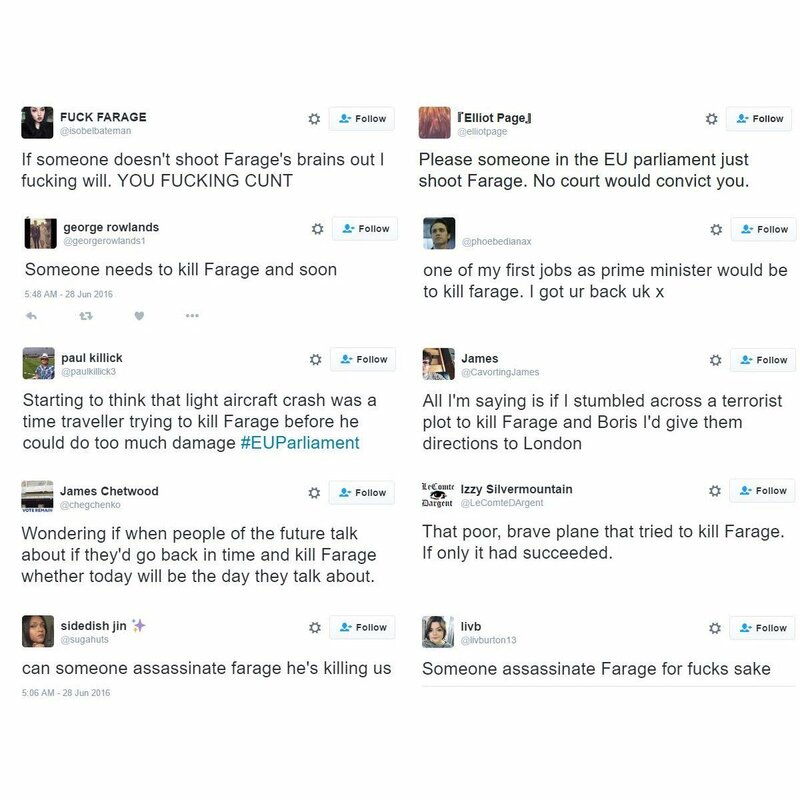 Presumably the consummate “vile racist” is Nigel Farage, and so he is dispatched swiftly to hell. Rogers Govender has since apologised privately to Dr Fraser: they have kissed and made up. 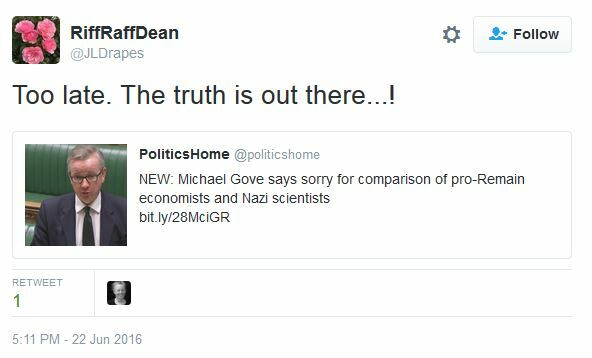 The Dean has not apologised to the 17,410,742 Britons whom he also patently smeared as ‘racist’, let alone the 79,991 of his own parish who voted for Brexit. Why should any of them bother ever again to set foot in Manchester Cathedral when its Dean believes either that Brexit Christians are all racist, or so undiscerning as to be content to sup with “vile racists”? He went further: “Apologised to my children for what the old have done to the young. Truly awful, truly catastrophic.” He is free, of course, to apologise to his own children for what he perceives as “the old” (ie 50+) inflicting evil upon the young. He later apologised for these tweets, but it was artful wording: “I tweeted this and should not have done and apologise for any offence caused. It was a weak moment…” To apologise for offence caused is not to apologise for the cause of offence. He patently believes this: Twitter speaks what the heart is full of. 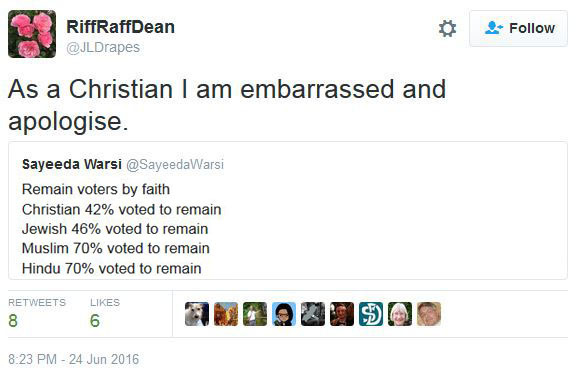 Perhaps it’s only Brexit Christians for whom forgiveness is impossible? Or is it just Tory Brexit Christians? Or is it specifically Nigel Farage, Boris Johnson and Michael Gove who are excommunicated with no hope of redemption? 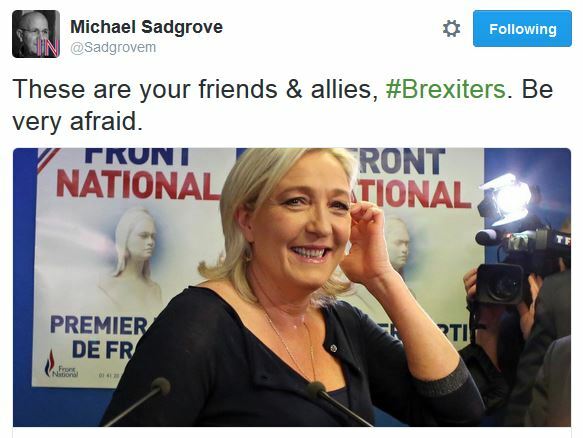 Note, once again, how the smear of fraternal racism is used to denigrate those who advocate Brexit. The name of Le Pen has long been associated with Holocaust-denial, racism and anti-Semitism (ie evil). These are now our “friends”, says Dr Sadgrove, while righteously preaching ‘good disagreement’ and objecting very strongly indeed to the term ‘theological illiteracy’ (when aimed at him). But it’s fine to scorn 17,410,742 Britons for wanting their democracy back because that’s exactly the sort of nationalist evil advocated by anti-Semites and Nazis. Durham voted to leave the EU: one wonders what 153,877 Dunelmians make of this sanctified slur. If these were aimed at Baroness Warsi, the Guardian and BBC would be raging: there’d be condemnatory speeches in Parliament and chiding proclamations from pulpits. But, hey, this is only Nigel Farage, and he deserves everything that comes his way – even a bullet between the eyes. If Brexit Christians are deemed to be a contributory cause of increased incidents of racist attacks and other hate crimes, then clergy might do well to reflect on the harmful effects of their own prejudiced sneers and inflammatory tweets. The Church of England is a national church: it exists for the service, spiritual well-being and human flourishing of all – including Brexit Christians and other Brexiters of all faiths and none. Nigel Farage is an Anglican Christian. He is someone’s son, husband, father and friend. If Jesus can commune with prostitutes and tax collectors; if he can bear even to touch lepers and kiss other outcasts, perhaps Brexitophobic vicars and Remainophile deans and bishops might condescend a little to speak (and listen) to us graciously, because we are the Church, too. We can take a touch of bitter saline speech, but, for God’s sake, don’t judge us all to be defenders of apartheid and avowers of evil. Why is the Church of England hosting a Satanic Fashion Show?